Villa ‘Tatu’ gets its name from the Swahili word ‘three’ as it is composed of 3 sections. The two outer buildings accommodate 2 large triple rooms, each with a king size double and a single bed and en-suite bathroom. The central section is a vast lounge with sitting area, a bar counter like table and an additional double bed. It is the perfect spot to relax and watch the sunset through the wide glass front facing the Indian Ocean. Upstairs 2 double rooms with en-suite bathrooms provide fantastic ocean view and the rooftop terrace invites to have dinner under African stars. In total the villa provides about 330 m2 of living space, surrounded by about 1800 m2 private garden. 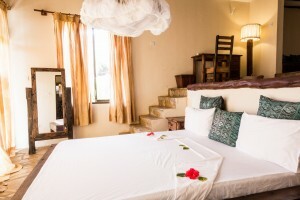 Villa Tatu accommodates up to 12 guests. We only let the villas exclusively, meaning that with a booking the entire villa is yours.